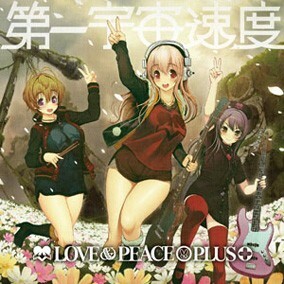 Following up their first album "GALAXY ONE" is their second album "LOVE & II+," from the 3-girl unit featuring Nitroplus's musical mascot girl "SUPER SONICO" on vocals and guitar - "First Astronomical Velocity!" Features all new songs as well as a few of those "Hey, why wasn't that song included on the first album!?" tracks on Disc 1, and the original soundtrack to the Windows game starring Super Sonico, "SoniComi" on Disc 2!! First-release limited edition bonus items "Live CD," "Limited Edition Strap," and "Alternative Jacket" not included.